This is a book about how language teachers themselves rather than curriculum specialists develop and implement their own courses. The paperback edition illuminates the process of course development through the narratives of six ELT teachers who have designed courses in widely varying contexts worldwide. Graves provides a framework for course design and examines how these six teachers have utilized or departed from the framework in meeting the challenges of their particular situations. Each narrative is followed by an analysis and a set of tasks that direct the reader's attention to a particular aspect of the framework. Uses unique case study approach to illustrate course design. 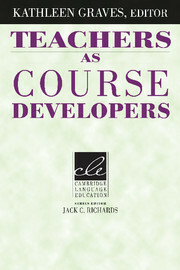 Provides a framework for course development that any teacher can apply. 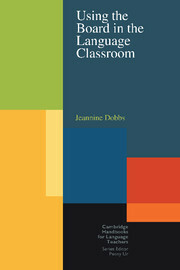 Offers tasks and discussions to facilitate use of the book in curriculum design classes. More than 130 activities as well as tips and suggestions for using the classroom board more effectively and efficiently.